For many centuries, persons were able to do their required ritual washing after visiting the cemetery at a fountain crowned by an erect stone lion. The sculpture was donated in 1747.Originally the octagonal fountain was in the opposite place, i.e. 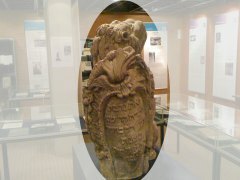 the lion was on today’s foundation, and the fountain itself was located on the basin. 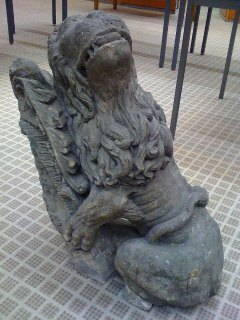 The lion sculpture, made of sandstone, was originally gilded; it is 73 cm tall and inclined at a forward angle. The mouth of the sitting lion is slightly open, his head turned. In his paws, he holds a vertical high-format cartridge. Its rocaille frame is crowned by a large shell located above a pair of wings. Upon the cartridge, slightly arched forward, there is a six-line Hebrew inscription in elevated letters. The sculpture was presented to the public in the exhibition“Der Gute Ort. 400 Jahre Jüdischer Friedhof Altona”, which the Hamburg Monument Foundation organized in May 2011 in the State and University Library Hamburg Carl von Ossietzky. 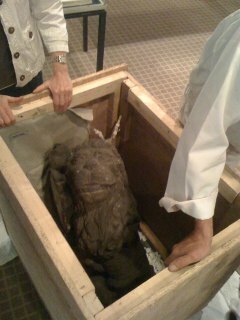 The original of the lion, brought by a concerned citizen to the Altona Museum during the chaos of World War Two, will return after restoration to the Eduard Duckesz House in the Jewish Cemetery Altona. 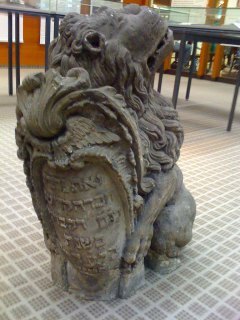 In 2012, the fountain was placed once again at its original location, the former entrance to the Sephardic section of the cemetery.However, for reasons of security, only a copy of the Baroque lion sculpture was included.